Visiting Ireland? If so, you’ll want to visit some of the country’s top historical attractions. Ireland is rich in history and, whether you plan to visit beautiful castles, outstanding cathedrals or any of Ireland’s beautiful other locations, it’s hard to go wrong. So what are five of Ireland’s Greatest Historical Attractions? Read on to find out. This cathedral is the earliest Christian site in Ireland, and is now the largest church in Ireland. The current cathedral, built between 1190 and 1270, replaced the wooden church that was originally on the site. The beautiful stone reliefs on the walls and the intricate architectural design make this Cathedral a beautiful place to visit. This cathedral is especially important because it was built in honour of Ireland’s patron saint. The story of St. Patrick is one of the most astonishing you could ever hear – he was supposedly captured in Britain and brought to Ireland as a slave initially, but escaped and returned home. Later, when he entered the Church, he returned to Ireland as a bishop and began working among the people he had once served. The cathedral itself and its grounds are an oasis of peace and tranquility in the heart of Dublin; like many Irish churches, it radiates an aura of history and incredible age. The Blarney Castle – home of the Blarney Stone – is perhaps the best-known historical attraction in Ireland. This world-reknowned landmark was originally built around 1200 A.D., but was later replaced by a stone fortification which was destroyed and then rebuilt. One tradition when visiting is to kiss the Blarney Stone, which is said to bestow “the gift of the gab” on a person – and they will never again be lost for words. Though the castle is not in pristine condition, it is still breathtakingly beautiful. The views from the top of the castle are incredible, and not many tourists are aware that the castle is only one attraction to see there; the area around it is filled with woodlands and secret, out-of-the-way places. Built around 3200 B.C., these passage tombs are huge and are aligned with the Winter Solstice Sunrise and the Equinox Sunrise. Although it’s unknown what they were originally used for, it’s clear that at some point they became locations where important individuals were laid to rest. It’s highly likely that they have spiritual and religious importance of some kind. Visitors can tour the passage tombs, which are located in Newgrange, Knowth, Dowth, Fourknocks, Loughcrew and Tara. Newgrange is especially well known, and is considered to be one of the most important and valuable megalithic structures in Europe. What makes Newgrange particularly amazing is what happens at the Winter Solstice. On that day every year, when the sun rises at precisely the right angle, the dawn light reaches along the passage and illuminates the central chamber for only 17 minutes. This alignment is too precise to be random, and it’s astonishing when you know that this monument was built 500 years before the Pyramids! People gather from all over the world to see the solstice at Newgrange, but only around a hundred can be in the chamber at dawn on the four days around the solstice when the sun is just right. Being there, and witnessing the mark of a new year as people did 5,000 years ago, is a very magical experience. The ruins of 12th-century Mellifont Abbey are the last remains of the first and most important Cisterian Abbey of its kind located in Ireland. Today, the ruins are still open to visitors. On entering, you can see the abbey church, which is set up like most major cathedrals, and the remains of the cloister. The chapter house is comparably intact, with some of the tiles that originally decorated the church still in use. Located in Monasterboice, the site has historical importance because conflicts between the Irish and the Anglo-Normans took place nearby. Mellifont is one example of the monasteries that dotted Ireland hundreds of years ago. It’s especially important because it was the first in Ireland to be built using the same formal layout as monasteries in Europe. Ireland became known as the Land of Saints and Scholars because of places like these, and any history buff could spend an enjoyable day wandering the ruins and imagining what life was like back then. 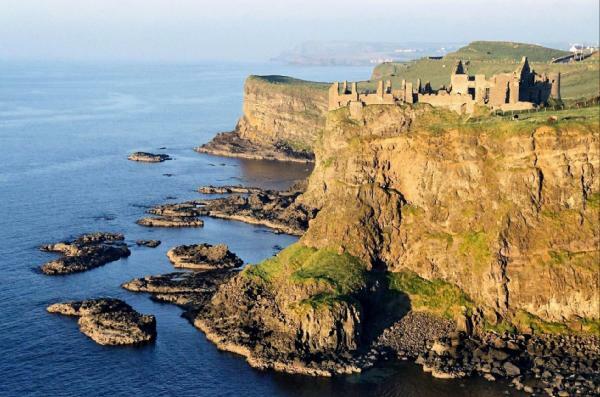 Located along the coast in Northern Ireland, Dunluce Castle was built in the 1200s. It’s built right along the cliffs and nearly dangles 100 feet over the ocean. It was an early stronghold, and the site dates back to the Vikings and the early Christians. Though the castle itself is in ruins, guided tours are available and the castle is open year round. The name of Dunluce is actually a phonetic translation of the Irish name “Dún Lios”, like many place names in Ireland. Its original meaning is “strong fort”, or “stone fort”. It has a long history of conflict and bloody fighting, and rebuilding after further desctruction; the place is desolate and brooding, and leads you to wonder what the stories the stones could tell. Louise Baker blogs about getting an online degree at Zen College Life. Her most recent post looked at the best online schools. Her blogs have been published on sites, such as MSN, Publisher’s Weekly, About.com and the Consumerist.